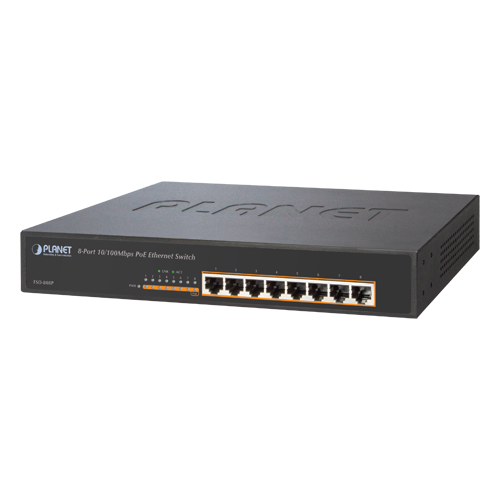 To fulfill the demand of sufficient PoE power for Fast Ethernet network applications, PLANET has launched a new member in the 802.3af PoE Switch family, FSD-808P, an 8-port 10/100Mbps 802.3af PoE Desktop Switch. The FSD-808P supports 125-watt PoE budget and 8-port 802.3af PoE power injector function to drive 8 IEEE 802.3af compliant powered devices. The FSD-808P also provides a simple, cost-effective and non-blocking wire-speed performance. Its compact 12-inch metal case is best for desktop deployment in SOHO or department network applications. Providing 8 IEEE 802.3af PoE interfaces, the FSD-808P is ideal for small businesses and workgroups to deploy the PoE network for the wireless access points, IP-based surveillance cameras or IP phones in any places easily and efficiently. The PoE in-line power following the IEEE 802.3af standard makes the FSD-808P able to power on 8 PoE compliant devices at the distance up to 100 meters through the 4-pair Cat 5/5e UTP wire. With data and power over Ethernet, the FSD-808P can reduce the need for extension cords and electrical outlets on the wall, ceiling or any unreachable place. In all, it lowers the installation costs and simplifies the deployment effort. Though the FSD-808P is fanless, it has an effective ventilation system, and it is quiet. The FSD-808P is able to operate reliably, stably and quietly in any environment without affecting its performance, and provides quick and easy PoE PDs deployment with power feeding. The Idle mode Link Down power saving of the FSD-808P complies with IEEE 802.3az Energy-Efficient Ethernet (EEE) standard to automatically lower power for a given port when it is idle, thus it greatly helps to decrease the energy consumption of the network. Providing 8 PoE in-line power interfaces, the FSD-808P can easily build a power centrally-controlled IP phone system, IP camera system and wireless AP group for the enterprise. For instance, up to 8 PoE IP cameras can be installed in the corners of the company for surveillance demands or up to 8 PoE wireless APs can build a wireless roaming environment in the office. Without the power-socket limitation, the FSD-808P makes the installation of cameras or wireless AP easier and more efficiently. 2014-12-12 2.1 Release for hardware version 2.0.